Deborah has made a colorful life journey from child actress to Broadway singer to Interfaith Minister to global peace worker – and now, through the Source of Synergy Foundation and the Evolutionary Leaders project, she is honored to support the movement of awakening consciousness. She is the Founder and President of the Garden of Light www.gardenoflight.org, an online platform for the emerging global spirituality. As Representative to the United Nations of the World Peace Prayer Society www.worldpeace.org Deborah spent more than 20 years promoting unity at the heart level through the prayer, "May Peace Prevail on Earth.” Rev. 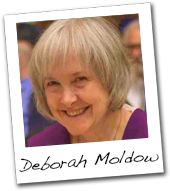 Deborah’s work as an ordained Interfaith Minister and with the United Religions Initiative encourages harmony among people of all faiths. She currently serves as a Creative Consultant for UNITY EARTH https://unity.earth.